The college basketball nation is recognizing what the Pac-12 Conference has known for the past couple of years -- Matisse Thybulle is the best there is when it comes to defense. 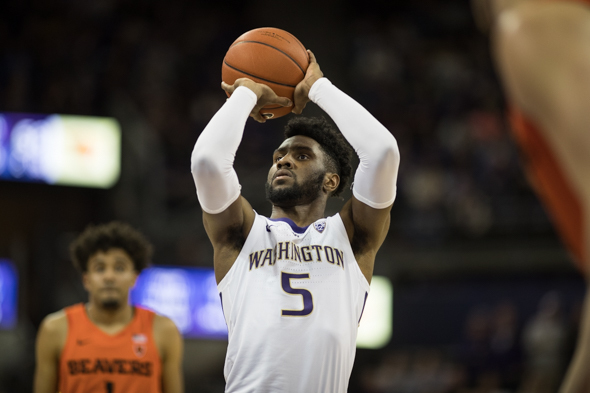 The University of Washington senior swingman was named winner of the 2019 Naismith Defensive Player of the Year Award, beating out some higher profile competitors such as Brandon Clarke of Gonzaga, De’Andre Hunter of Virginia and Zion Williamson of Duke. 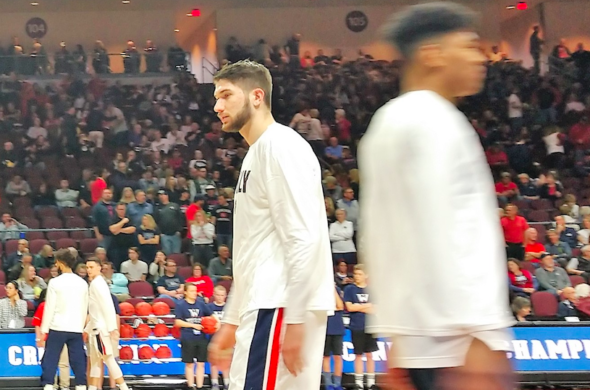 After a 20th consecutive NCAA Tournament appearance over 20 years, the Gonzaga Bulldogs finished another splendid season Saturday the same way they have the past two decades -- no title. College basketball's highest-scoring offense met its match in the defense of third-seeded Texas Tech, which is going to the Final Four for the first time. The Red Raiders disrupted and dismayed the No. 1-seeded Zags 75-69 (box) in Anaheim. COLUMBUS, Ohio -- For as much as fans thrill to the memorable upset, the NCAA Tournament is filled with many more routine routs of the sort witnessed Sunday at Nationwide Arena. Tourney seedings expose the many layers of college basketball, even among the 68 teams that are, more or less, the best of the 330-plus outfits eligible to participate in the amusement. COLUMBUS, Ohio -- As someone who freely admits he's "49 going on 14," Mike Hopkins at the moment is all Disneyland, horse rides and slip-n-slide. In his second year as a college basketball head coach after a two-decade apprenticeship, his giddy meter has pinned the needle. 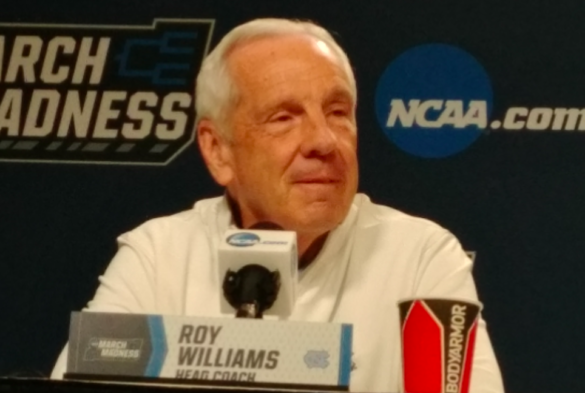 "We're in March Madness playing against North Carolina," he said, beaming, Saturday afternoon. "I mean, is there anything better?" COLUMBUS, Ohio -- The wheels weren't exactly coming off. But as Washington's 12-point halftime lead shrunk to 54-53, a few lug nuts seemed to be visible on the Nationwide Arena floor. 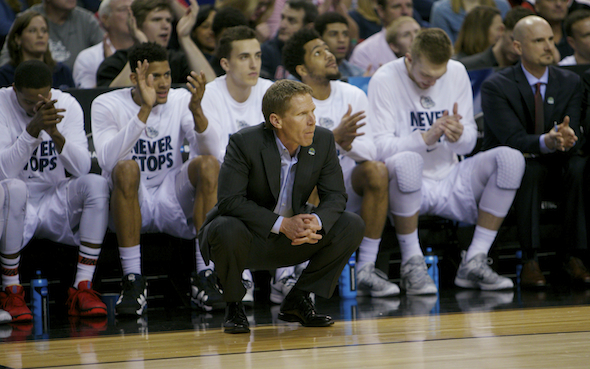 After a grim first half, Utah State was making its run in the NCAA Tournament opener. That's when the lessons of December paid off. 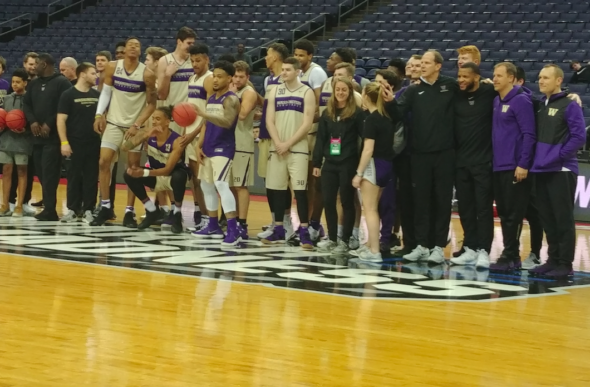 COLUMBUS, Ohio -- For a gregarious guy who has been to 18 previous NCAA Tournaments as an assistant coach at Syracuse, Mike Hopkins was unusually low-key, maybe even tense, as the Huskies head coach lingered Thursday here around a milestone -- Washington's first appearance in the Big Dance since 2011. Thiel: Which Huskies show up for NCAA tourney? 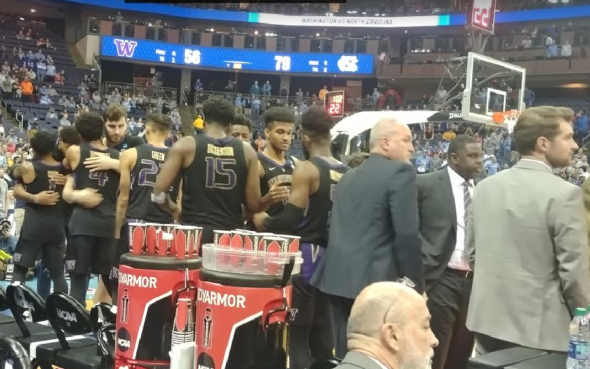 Two ways to look at the University of Washington's first appearance in the NCAA men's basketball tournament since the simpler days, back when the FBI wasn't the the principal force in college basketball. From 30,000 feet: Sunday's selection marks an astonishing accomplishment, given that two years ago, following a 9-22 season and the firing of coach Lorenzo Romar, the program looked as bleak as Australia's Outback in The Road Warrior. LAS VEGAS - For one night, just about everything that could go wrong did go wrong for the Washington Huskies. 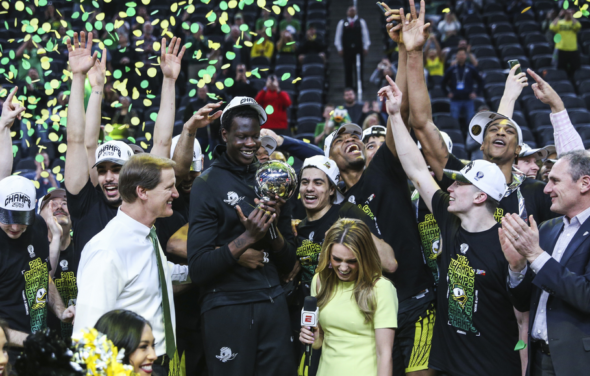 The silver lining was that the Huskies' 68-48 loss (box) to Oregon Saturday night in the Pac-12 Tournament title game at T-Mobile Arena was not likely fatal to their bid for an NCAA Tournament berth. 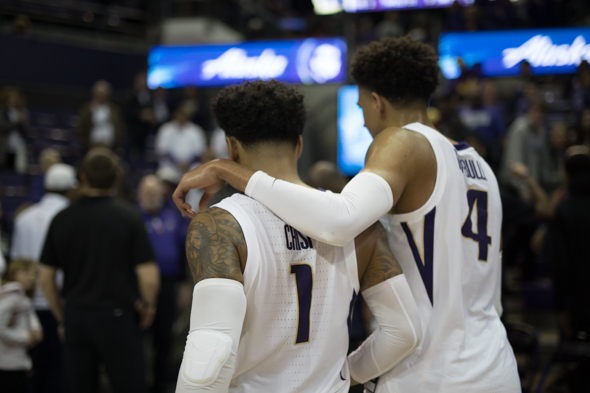 LAS VEGAS - Decades have passed since the Pac-12 has seen the feats Matisse Thybulle and the Washington Huskies have produced this season. The Pac-12 wasn’t even the Pac-12 the last time such things were accomplished. Team-wise, the biggest thing Friday night at T-Mobile Arena was that No. 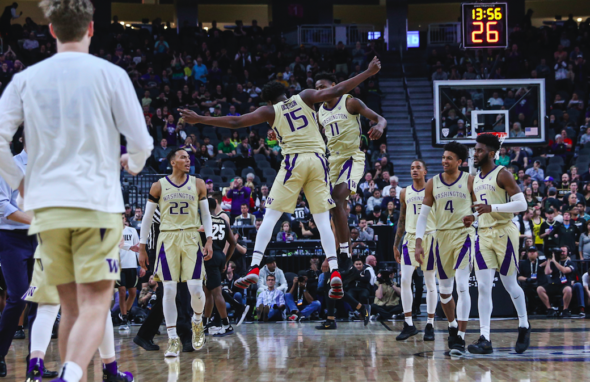 1-seeded Washington advanced to its first Pac-12 Conference tourney championship game since the 2010-11 season with a 66-61 semifinal victory (box) over the Colorado Buffaloes. LAS VEGAS - The sigh of relief covered the entire 1,700 miles from southern Nevada to Seattle. Despite controlling the pace almost from start to finish, the No. 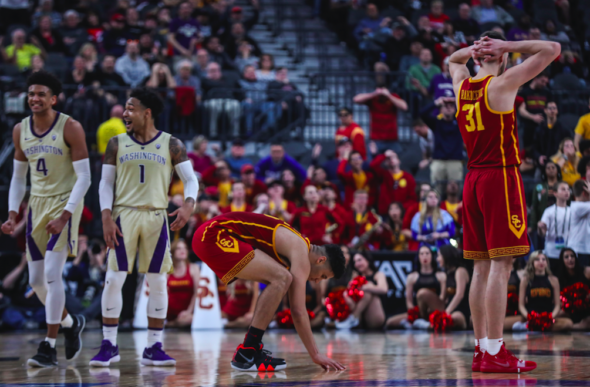 1-seeded Washington Huskies needed a mistake from eighth-seeded USC with five seconds to play to ensure a 78-75, first-round Pac-12 Tournament victory (box) Wednesday at T-Mobile Arena. After a relatively easy dispatch of ninth-seeded Arizona 78-65 Wednesday in the opening game of the Pac-12 Conference men's basketball tourney in Las Vegas, eighth-seeded USC draws No. 1 seeded Washington at noon Thursday in a quarterfinal matchup. The Huskies beat the Trojans 75-62 in the teams' only meeting Jan. 30 at Hec Ed. LAS VEGAS - They are a basketball team that occupies the No. 1 position atop the national collegiate polls. They are about to be one of the top four seeds into the NCAA Tournament field, despite having their 21-game winning streak snapped Tuesday night. 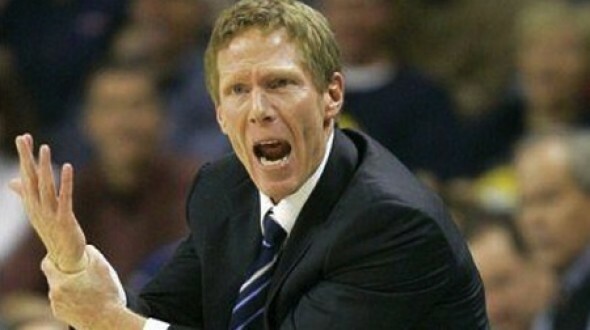 Next week can't get here fast enough for the Gonzaga Bulldogs. Big awards day for University of Washington men's hoops. The Pac-12 Conference announced Monday that sophomore guard Jaylen Nowell was player of the year and coach Mike Hopkins repeated as coach of the year, as did senior Matisse Thybulle for defensive player of the year. Since the inception of the defensive award 16 years ago, it's the first time all three awards have gone to the same school in the same season. 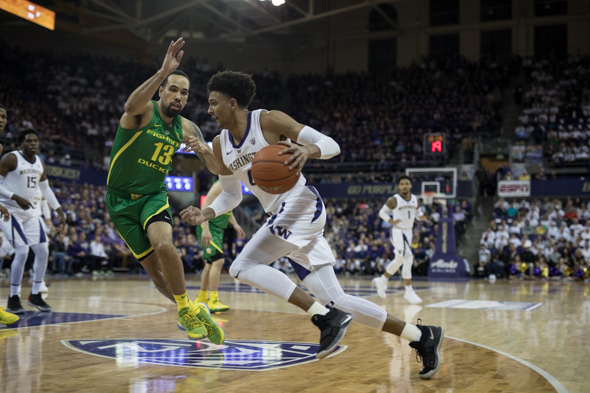 Matisse Thybulle and Jaylen Nowell, dominant forces that led the Washington Huskies to the Pac-12 Conference regular-season championship, were named to the 10-member All-Pac-12 first team Monday, as was Washington State's Robert Franks. UW's Noah Dickerson was an honorable mention. It was the fifth time in Pac-12 history UW had three selections. For those who look upon on the NCAA men's basketball industry as only slightly less corrupt than the Pentagon, more eyebrows broke the arch limit Friday. Louisiana State coach Will Wade was suspended after a report that he was recorded on an FBI wiretap talking to convicted fraudster Christian Dawkins about making payments to a recruit who became his starting point guard. 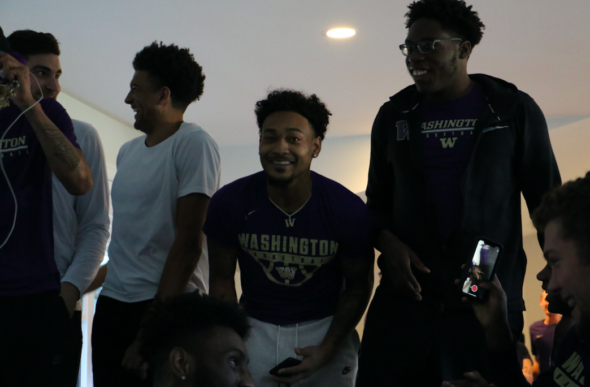 The annual trip to the Bay Area brought the Huskies men's basketball team back to earth. But at least they are not beneath it. 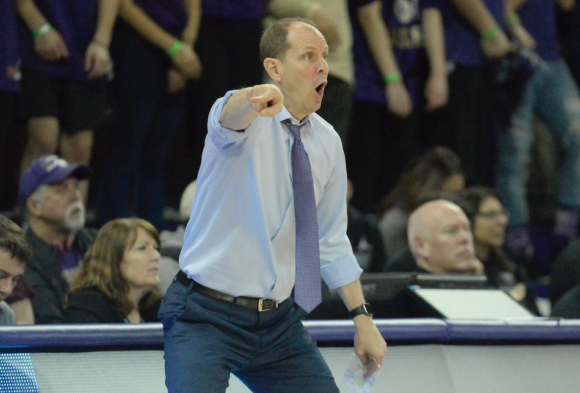 Three days after a grim loss to a Cal team that had been winless in Pac-12 Conference play, Washington rediscovered its defense just enough to hang on, 62-61 against Stanford Sunday afternoon in Palo Alto. As Gonzaga rose to No. 1 Monday, the Washington Huskies for the first time this season made the Associated Press's weekly top 25 college basketball poll, ranked 25th with 92 points, two ahead of Louisville.